There are over 600 species of Ficus, most of them tropical and evergreen. Ficus produces a unique "fruit" which is actually an inverted flower. Ficus is one of the most loved bonsai for many reasons. 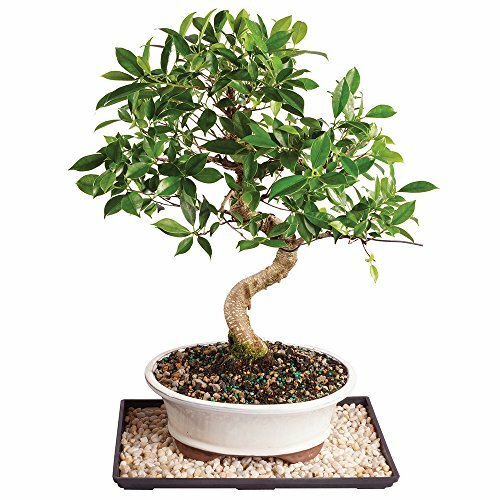 Ficus are one of the best varieties of Bonsai trees for indoors. They're very easy to take care of and need little attention. In the ficus family, the Golden Gate variety is the best for growing indoors. The attractive gray trunk is thick and sturdy topped by small, dark green oval foliage. It is an excellent tree for beginners, as most species of Ficus are fast growers, tolerant of most any soil and light conditions, make fine indoor bonsai, and perhaps most importantly, are remarkably forgiving of those just learning bonsai watering techniques. Comes with Humidity tray and decorative rocks to counteract the effects of indoor dryness and outdoor windiness. Excess water collects in the tray and slowly evaporates; increasing the humidity around the tree and improving the growing environment. Your bonsai tree thrives while windowsills stay dry and debris-free. A tray can also be used outdoors to improve conditions in dry or windy sites. Each live plant is shipped with the Phytosanitary Certificate as required by the USDA. SIZE: Your large bonsai comes in a 12" container. AGE: This Golden Gate Ficus Bonsai is 17 years old.